We’ve got another holiday coming up on Monday...Memorial Day. What does it mean to you? Long weekend and cookout? Permission to wear white clothes and the start of summer? Time was, Memorial Day meant watching parades, waving American flags, and buying poppies. These days, many people aren’t quite sure what the holiday is even about, much less aware of its history. Memorial Day, or Decoration Day as it was formerly called, commemorates U.S. men and women who have died while serving in the military. First enacted to honor soldiers of the Civil War, it was expanded after World War I to include all military personnel who died during service. There are many stories as to the actual origin of Decoration Day, with more than two dozen cities and towns laying claim to being the birthplace of the tradition. Waterloo, N.Y., was officially declared the birthplace of Decoration Day by President Lyndon Johnson in May, 1966, but that was nearly one hundred years after its “official” inception after the Civil War. All of the planned and spontaneous gathering of people during 1860s to remember those that died in the war tapped into the general human need to honor the dead. These services likely contributed to the growing movement that culminated in the proclamation that Decoration Day be observed nationwide by Union Gen. John Logan on May 5, 1868. It was officially observed for the first time on May 30, 1868 when the graves of Union and Confederate soldiers at Arlington Cemetery were decorated with springtime flowers. In the South, Confederate Memorial Day took shape on three different dates: on April 26th, the anniversary of General Joseph Johnston's final surrender to General William T. Sherman; on May 10th in South and North Carolina, the birthday of Stonewall Jackson; and on June 3rd in Virginia, the birthday of Jefferson Davis. Memorial Day is now celebrated on the last Monday in May, and several southern states have kept the additional separate day for honoring the Confederate war dead. But there’s a local story that nearly got lost to history, and it’s still not widely known. Yale University historian David W. Blight published his research concerning the ‘real’ first Memorial Day in his 2002 book, Race and Reunion: The Civil War in American Memory. Charleston Post & Courier’s Brian Hicks wrote a great article on it in 2009, and the event was memorialized by Mayor Riley with a dedicated plaque in 2010. Read the story and pass it on! Eventually, our collective history will be restored to include this amazing event. Robert Knox Sneden, Charleston S.C., A.D. 1864. Library of Congress, American Memory. 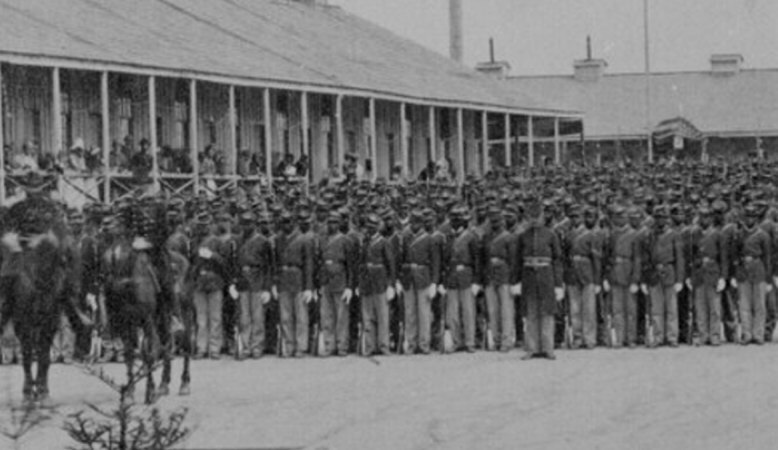 During the Civil War, captured Union soldiers were held as prisoners at the Washington Race Course (now Hampton Park). Some officers were apparently held in the Clubhouse, but most of the soldiers were kept in an outdoor camp under reportedly deplorable conditions during the last year of the war. 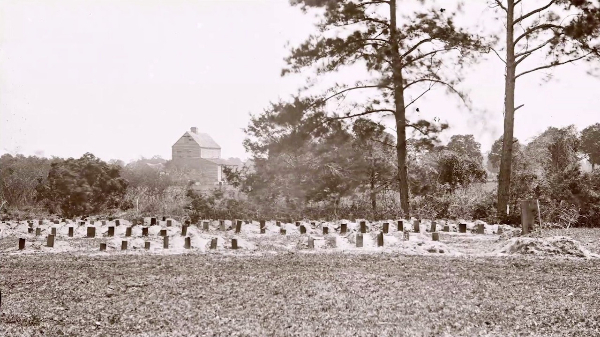 At least 257 Union soldiers died here from disease and exposure and were hastily buried in a mass grave. In the beginning of 1865, Charleston lay in ruin. 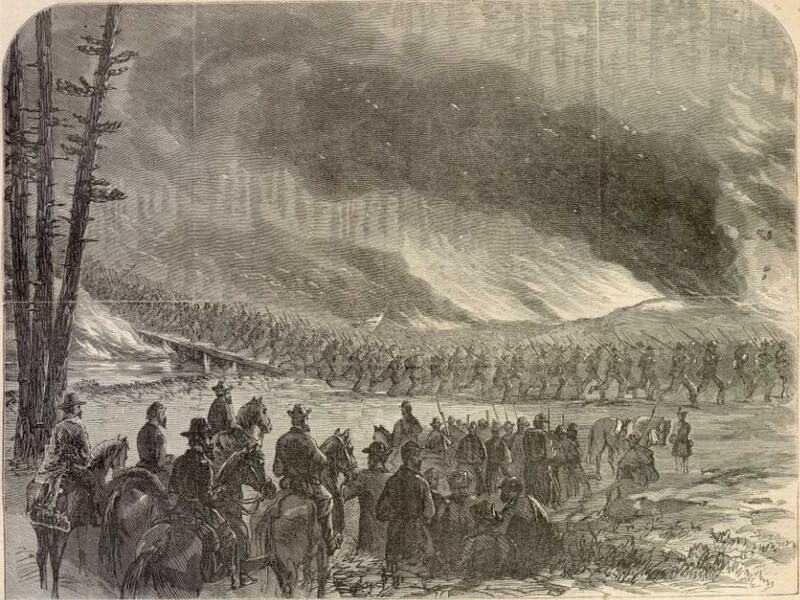 What the great fire of 1861 destroyed had not been rebuilt; Union bombardment that began in 1863 lasted for over a year and additional fires furthered the city’s destruction. Anticipating Sherman’s army, the Confederates evacuated the city and the mayor surrendered to Union forces on February 18th. By the end of the month, few white residents remained. Thousands of black Charlestonians remained, however, most of them former slaves. In the spring, black Charlestonians held a number of large parades and commemorations celebrating the end of the war. Each one seemed to be larger and larger, growing from a few hundred to 2,000 then to 3,000 people. The largest of these events took place on May 1, 1865. A New York Tribune correspondent described "a procession of friends and mourners as South Carolina and the United States never saw before." According to an article in the May 2, 1865 edition of the Charleston Daily Courier, “The procession was formed shortly after nine o’clock, and made a beautiful appearance, nearly every one present bearing a handsome bouquet of flowers”. The procession was led by 2,800 singing black schoolchildren carrying armloads of roses, followed by several hundred black women with baskets of flowers, wreaths and crosses. Then came black men marching in cadence, followed by contingents of Union infantry and other black and white citizens. All gathered in and around the cemetery’s enclosure and the children's choir sang patriotic songs and various spirituals before several black ministers read from the scripture. Following the dedication, flowers were placed on the graves. Afterwards, the attendants laid out picnics on the grass of the race course and watched infantry drills and listened to speeches. 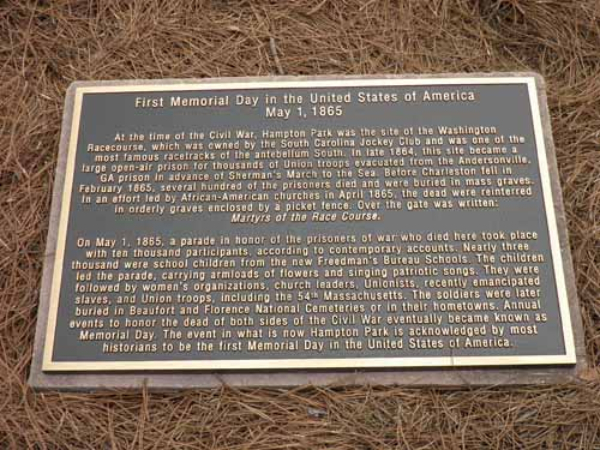 David W. Blight wrote, “This was the first Memorial Day. African Americans invented Memorial Day in Charleston, South Carolina. What you have there is black Americans recently freed from slavery announcing to the world with their flowers, their feet, and their songs what the war had been about. What they basically were creating was the Independence Day of a Second American Revolution.” He speaks about this first Memorial Day in this American Experience clip from "Death and the Civil War". Dr. Blight was present during the dedication ceremony in Hampton Park in 2010; the marker lies in the central flower bed at the head of the lake. The soldiers honored in this first Memorial Day were subsequently re-interred in the National Cemeteries in Beaufort and Florence. The grounds of the Washington Race Course hosted the South Carolina Inter-State and West Indian Exposition in 1901-2. Afterwards, the City of Charleston acquired the land and built one of our favorite parks; the old tracks of the race course were paved and named Mary Murray Blvd. Have you been to the park lately? The flowers are in their height of glory! Do you know someone who’s looking for a home to rent? 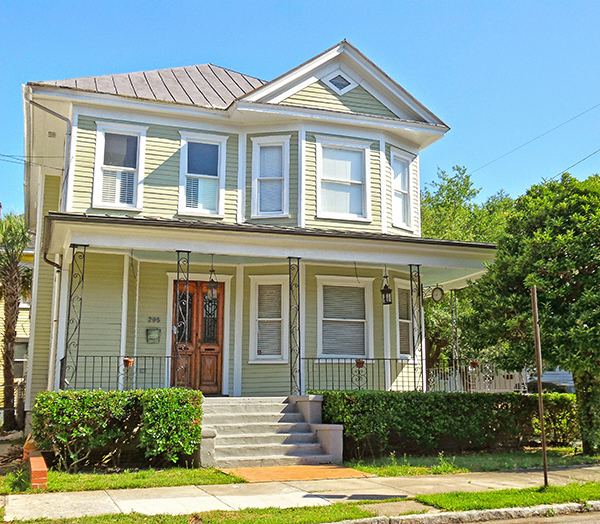 Within easy walking distance of the park, Ginger has a beautiful home for rent in the popular West Side neighborhood... it’s just gorgeous. Click below for full listing information and please call Ginger at 843-513-5525 to schedule a showing!